Easy Step-By-Step Guide to Catching the Bus from Chiclayo Peru to Cuenca Ecuador! Stuck and struggling to figure out how to catch a direct bus from Chiclayo in Peru to Cuenca to Ecuador? Pulling hair out trying to find Cuenca Ecuador bus routes information? Scoured the internet but only come across broken websites, information or guides that explain Cuenca to Chiclayo and beyond which doesn’t really help in your case? First thing is first – this route seemed to be done by two companies: Azuay International and Super Semeria S.A. Feel free to check both companies websites for more information but at the time of writing this both either had no information or incorrect information on getting from Chiclayo to Cuenca by bus. This guide will focus on Super Semeria S.A as this is the company we went with but after going to the bus terminal in Cuenca I can confirm Azuay International currently runs this service too with similar stops and timing – if anyone has success or more information on them please share in the comments below. 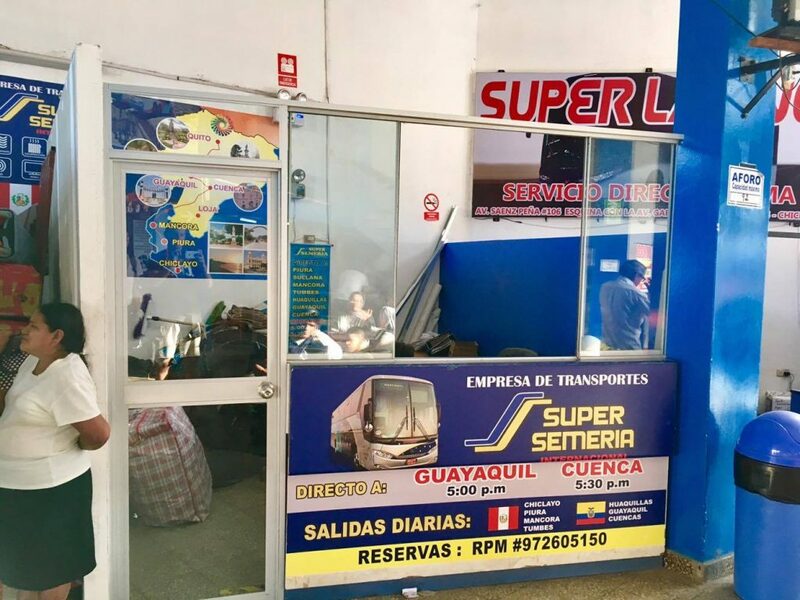 As it stands Super Semeria currently leaves daily with two direct buses; The Chiclayo to Guayaquil direct bus leaves at 5 pm and the Chiclayo to Cuenca direct bus leaves at 5.30pm. There is no change of bus and the ticket cost is currently $25 USD. The bus was completely full but mainly used by locals who booked last minute. Same day booking should be fine but I recommend to get them in the morning to be safe. The address listed for Super Semeria in both Google and their own website is incorrect. There is a cargo company here of no relations Its correct location is at Terminal Nor Pacifico a few blocks south on a major roundabout. If you need a major landmark also on be roundabout is the Chiclayo Open Mall which also has a huge supermarket and a western union with great rates on sol to usd with no conversion fee if you need to get ready for Ecuador. You can also store your luggage at Super Semeria any time that day before catching your bus from Chiclayo to Cuenca later than day. Photographic Proof that the Super Semeria bus from Chiclayo to Cuenca does exist! Now if only they could produce a correct Super Semeria bus schedule! If you want to pick the Peru to Ecuador bus up along the way it also passes through Piura at around 8pm and Màncora just before midnight. The Super Semeria bus from Chiclayo to Cuenca is quite simple with one level, no TV and be warned – the bathroom did not work. We slept really well surprisingly but maybe being ear plugs. There are two mandatory stops in the way: the first is just past Màncora where you remove your hand luggage and are checked (boarder guards check under the bus for stowed luggage) and the next is around 1.30 am at immigration. Be warned even at night this took us 2.5 hours and we were all stuck in a giant room which was overcrowded and very, very hot. My advise would be to get off the bus as quick as possible and rush to the front of the line – in this case it is OK to be that person. Finally we arrived in to Cuenca bus terminal at around 8 am where it is a pleasant 20-25 min walk into town if you wish or there are plenty of taxis waiting. If you need onwards travel the bus from Cuenca to Guayaquil leaves every 40 mins or so and costs $6 USD and from there your options are pretty much limitless! And as I said – just reverse for Cuenca to Chiclayo! 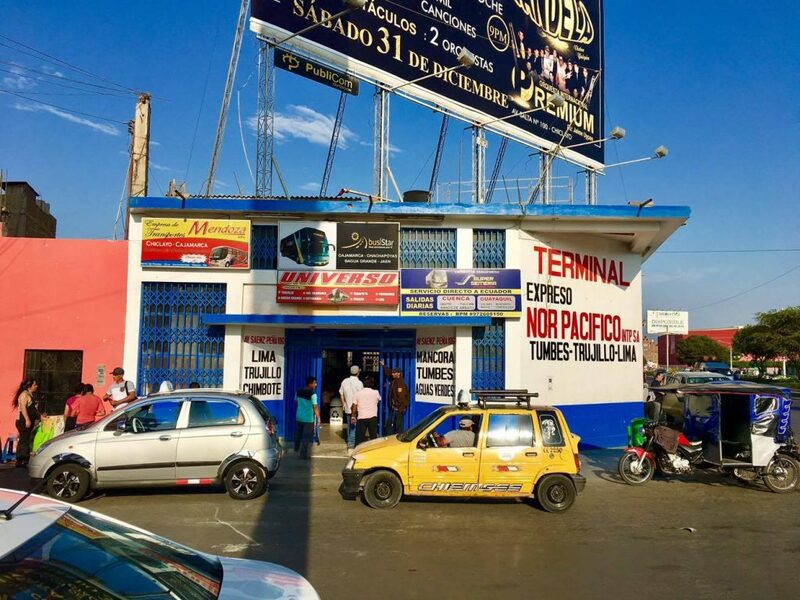 Or if you want to really take the path less followed why not look at this guide to the La Balsa border crossing between Peru and Ecuador! 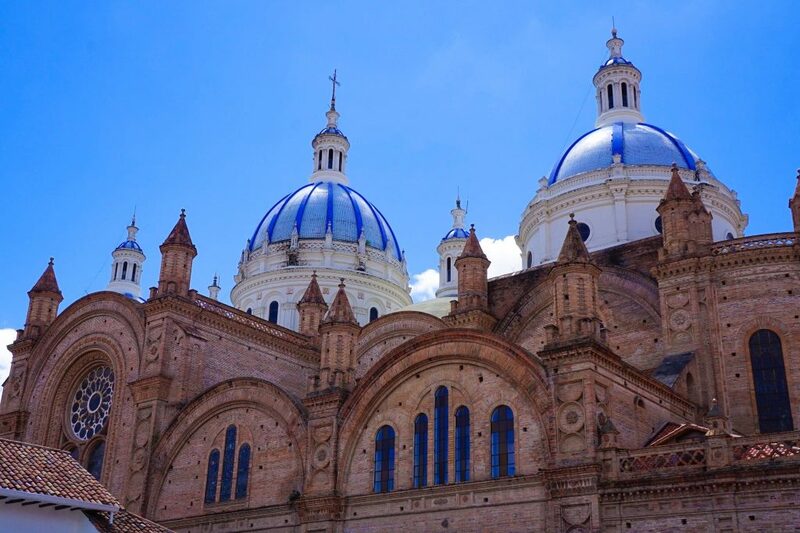 After your travel to Cuenca Ecuador you could go anywhere…Who knows! 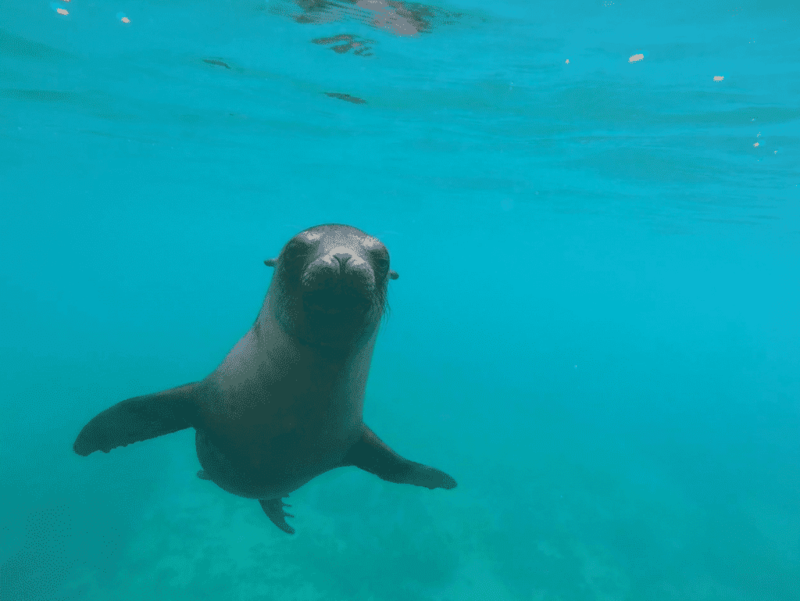 Maybe even to swim with sea lions in the Galapagos! 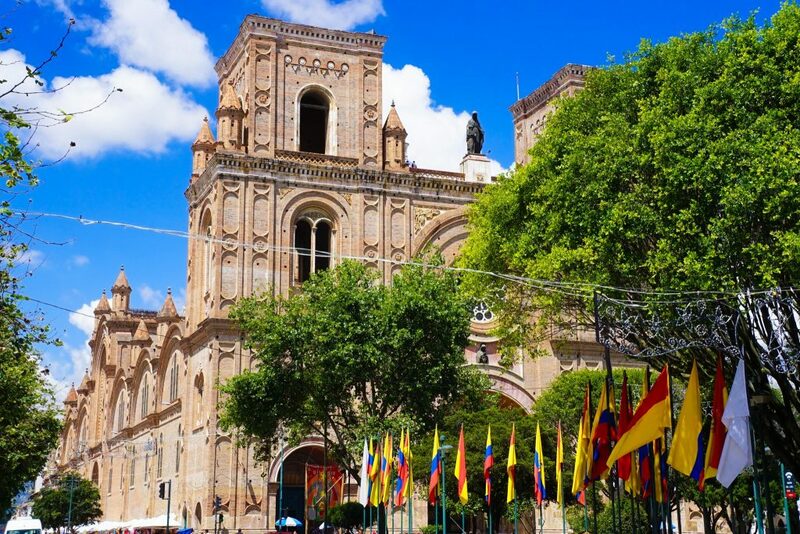 Hopefully you find this guide to catching the bus between Chiclayo and Cuenca useful and enjoy your travel to Cuenca Ecuador … I wish I had found this information sooner when I was trying to travel to Cuenca ecuador! As always things can change so please if you do find some new information on the Peru to Ecuador bus come back and update me in the comments below. Have you booked a room in Cuenca yet? The best places tend to sell out fast…. Compare great deals for hotels, hostels and B&B’s now with a best rate guarantee, so you can splash out on other things instead!